Art and the systems of your life. Did you know that you are part of a system? In our 21st century lives, it is easy to think of ourselves as individuals, and not connected to our circles of people in any way. Isn’t that what the 20th century Western world has led us to believe? Me, Me, Me, and Me. This line of thinking does not really parallel the overall trends in human history, nor what biology tells us about how homo sapiens are wired. Even in the mental health field, the trend over time has been to pathologize the individual, and remove them from their “system” to make them better. As a veteran employee of the in-patient psych world, I can attest here to the high recidivism rates when adhering to this line of thinking. Let’s think about your system. Please find some paper and a writing utensil and spend a few minutes creating a family portrait. “Family” is a loose term which might mean your family of origin, the current people with whom you reside or even your workmates. Rather than drawing actual people, faces or stick figures, please draw cogs (like the image in this blog entry) to represent each person in your family. As you assign a cog for each person, please think of how much power or presence they have within the system, and represent this power (or lack of power) with the size of their cog. Think of other emotions or behavior exhibited within the family. Can you stretch your imagination to represent this in the cog you draw for that person? 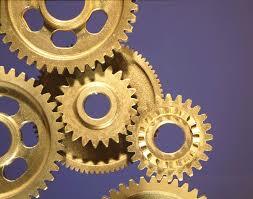 Are the cogs close together and humming along nicely? Are any of the teeth broken, causing the entire system to be shut down? Could you change or fix the system if something is not working? Can you recognize a problem being caused or solved by the entire system working together? If you were to draw separate images to represent your family of origin and your current family as cogs, do you see any patterns that have been repeated? The bottom line is that we create each other. This simple art exercise might bring up some powerful feelings or insight into your current dynamics. Investigating family dynamics as a system can be an enlightening opportunity to address a family or individual’s problem. The risk sometimes involves investigating how you yourself might be contributing to the problem. If you find that you have a visceral experience to this art exercise, please do yourself a favor and track down a local art therapist or marriage and family therapist to further explore your raw feelings.